Most of our guests come to Ripertoli with their family, often 3 generations, and so we try to cater for the needs of small and larger children. 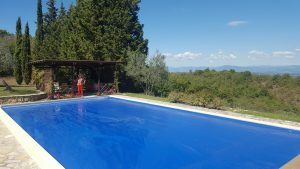 Ripertoli is unusual in having an electric pool cover which is totally child safe – once closed you can jump on it though we would rather that you didn’t! No child could fall in. We have 2 cots – a large wooden one and a collapsible smaller travel cot, both with mattresses bought new in 2017. 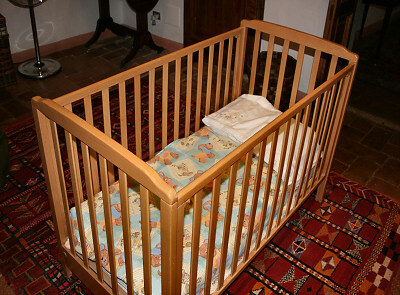 We also have a child alarm which works from most of the bedrooms in the main house to the back terrace or loggia, but you will have to experiment if the baby is in one of the capanne. The distances are not very far but the walls are very thick. 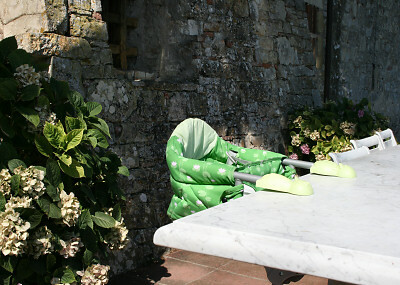 We have a modern version of a high chair which attaches to the table and can be moved from place to place and taken to restaurants – though Italy being child friendly, such a thing will be provided in most restaurants. We also have a smart free standing high chair which is light and easy to use, new in 2017. There is an excellent shop in Greve which has everything you could want for babies but it is hidden so you might easily miss it. It is in the basement of the pharmacy at the traffic lights in the centre of Greve. You have to ask the staff to be taken down there, but once there you really will be able to find everything you need. Babysitting can be arranged via Marisa and her family. However, children are so welcome in Italian restaurants that there is not much demand for it. 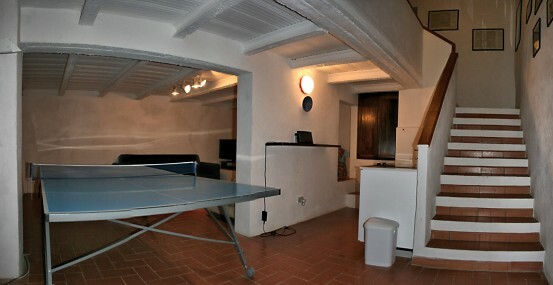 For the slightly older, and in case of bad weather, we have board games stored in the kitchen, and a table tennis table in the Aia capanna. We also have DVD players in the salotto and the capanne. We don’t have a stock of children’s DVDs, the ones we have being more for adult tastes, but many people will bring their child’s favourite DVDs with them. The salotto has a large-screen TV which is often used as a communal TV/DVD room for children. Older (teenage) children value the privacy of living in the capanne without immediate parental guidance. Our experience is that they have their own timetable, musical tastes and life style and it suits us very well to leave them to get on with it. If there are any questions you need answered before you leave home about the provision we make for children please phone or email us – we are always happy to advise.